Pathologists Use Facebook And Twitter To Share Insights About Puzzling Cases : Goats and Soda Dr. Jerad Gardner is a pioneer in using Twitter and Facebook so doctors around the world can talk about puzzling cases. The practice has its critics as well as its supporters. 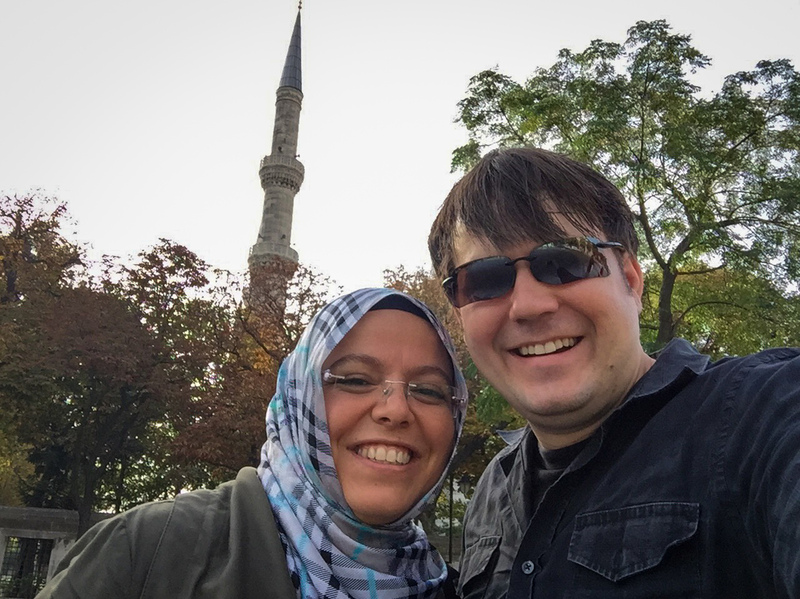 Dr. Jerad Gardner (right) and Dr. Pembe Oltulu, a pathologist from Konya, Turkey. They'd connected over Facebook. She flew to Istanbul for a real-life meeting when Gardner had a layover at the airport on a trip to meet a sarcoma patient he'd learned about on the social media platform. In August, a doctor in Spain posted x-ray and microscopic pictures from a man's thigh on Twitter, asking for help. The physician was concerned that he had cancer. But the images that pathologist Jerad Gardner saw on his screen in Little Rock, Ark., reminded him of something else he had come across a few times — a benign tumor that looked like a rare form of cancer. He suggested the Spanish doctor perform a molecular DNA test. It ultimately revealed that the tumor wasn't cancerous. No one thinks that doctors should make a diagnosis via Twitter. But there is a growing movement to use social media to share information. And Gardner, an associate professor pathology and dermatology at the University of Arkansas for Medical Sciences, is one of the pioneers, building a community of followers and colleagues on Twitter and Facebook. "Dr. Gardner is a leader in approaching diagnoses in new ways, embracing the latest technologies and innovations medicine has at its fingertips, " says Dr. R. Bruce Williams, president of the College of American Pathologists, an organization that advances the practice of pathology and laboratory science. As with almost every use of social media, this practice has its critics as well as its supporters. Telepathology — sending images to diagnose, educate and research diseases — began decades ago, says Dr. Ronald Weinstein, director of the Arizona Telemedicine Program at the University of Arizona. Weinstein is sometimes described as the "father of telepathology." In fact, he is reported to have coined the term. He wrote the first paper on the topic and organized the first international exchange between the U.S. and China in 1993 — using the fiber-optic cables of an international phone to transmit microscopic photos. But when it comes to asking for opinions on social media, "there are legal, regulatory and 'quality of service' issues," Weinstein says. Is the remote physician licensed in the country where the patient lives? Are patients giving informed consent for their doctor to share when their photos are published online? And is medical information being transferred securely for the patient's privacy and confidentiality? The 35-year-old Gardner started out by Facebook-friending peers he met at annual medical meetings. In 2013, he created two discussion groups on the social media site. One focused on skin conditions and the other focused on tumors found in bones and soft tissue. He thought he would post a few interesting medical cases for fellow pathologists, who study diseases. "Before I knew it, people from all over the world were posting cases and asking not for official advice but for an approach on how to handle cases." Thousands of people entered the groups within the first few months and more than 47,000 people have joined so far. They are doctors and nurses, medical students and, sometimes, patients. Members come from all corners of the world, from Nepal to Syria to Colombia. One time, a doctor in Afghanistan emailed Gardner pathology images from a young man who had nodules on his neck, chest and other body parts. He had been seeing doctors for years and receiving treatment for tuberculosis. Gardner recognized his condition as a fungal infection and suggested the doctors test for HIV because of the fungus' spread across his body. The HIV hunch was not correct. The patient tested negative. But Gardner also sent the doctor a chapter of a book he was co-authoring that described how farmers are often infected by the fungus through a pre-existing wound, since the fungus naturally exists in soil and plant matter. The Afghan doctor learned that the patient had been in a car accident that sent him flying into a vegetable field. "Perhaps he had multiple, small penetrating injuries when he crashed into the farm field," Gardner wondered in an email. The patient started a treatment for the fungus and his condition improved in follow-up visits. Gardner's YouTube and Snapchat channels, launched in Nov. 2012 and Feb. 2017 respectively, feature instructive videos and photos. And on Instagram, which he joined in May 2015, he posts images of cells that are meant to show practitioners new diseases but that could pass for abstract art. "Awesome rainbow polarization of urate crystals from gouty tophus. Pretty but painful," he writes to his 29,000 followers. Gardner also uses social media to communicate directly with people who have been diagnosed with rare cancers. They mainly want to know more about their own diseases. Once, Gardner says that a woman who had a rare type of cancer caused by a defect in her DNA asked, "If it's in my genes, then my kid will get this, won't they?" Gardner explained that with her kind of cancer, only the tumor cells mutate. There wasn't an increased risk for her child because the mutation isn't inherited. "That mom probably lay in bed at night worrying that her kid had this bad risk of getting cancer, and it just took me 30 seconds of time to explain," Gardner says. Weinstein says there may also be cultural barriers and ethical questions when working with people from afar. In developing or war-torn countries, patients might find out that they need treatment that doctors nearby don't have the resources to provide. Gardner, a fellow at the College of American Pathologists, acknowledges this and other challenges. "I'm no stranger to criticisms about social media. It's been a long uphill fight to convince my colleagues that this is something we should do and I know there are still naysayers. Most of those are people who don't actually use social media so they don't really understand how it works." In terms of privacy, he says that images where identifying information is left out "do not require patient permission to post on social media, either ethically or legally." An article he co-authored, published in the American Medical Association Journal of Ethics, states that images omitting a patient's identifying details on social media, just like in medical journals, don't violate privacy law. In Gardner's view, it's a good thing if "everything on social media is public. If I do something wrong other people can call me out on it immediately." He adds that the immediacy and wide reach of social media offer benefits not found in medical journals — but with caveats. "These are great places for people to think through different possibilities, but they certainly don't take the place of a real consult," he says. He stresses that doctors and patients use caution. "Anyone can say anything in a Facebook group or anywhere on social media. Just like you can't trust things that you read on the Internet, you have to take them with a grain of salt and do your own research." On any given day, Gardner interacts with 10-20 people online. Sometimes he looks at pictures and tells health care workers that he just doesn't know. Sometimes he argues with doctors, as in a case where he disagreed with a pathologist's analysis of a mass on a child's face in India. Gardner didn't think the images showed cancer and worried that invasive surgery would leave the young patient scarred for life. As with some online interactions, he never found out what happened to the child. The virtual exchanges occasionally blur with real life. Gardner has published papers with fellow pathologists whom he has only met online. Some have become actual friends, like a Turkish pathologist who flew 400 miles within Turkey to meet Gardner when he was attending a conference in Istanbul. "Jerad was my Facebook mentor and his updates taught me much more than I would have learned just in my residency training. Thanks to his amazing Facebook pages, I was able to access [images of] the rarest of the rare [cancer] cases and the approach that world famous pathologists follow to diagnose them." Jaime Mejia, a Colombian pathologist, adds that through the discussion groups, Gardner "has given us the opportunity to get involved with other pathologists around the globe." Gardner doles out digital insights in his spare time, during gaps in his day. He might be checking his Twitter or Facebook feeds from his iPhone early in the morning, while getting haircuts, at weddings or waiting in line at Disney World on family vacations. It's a far cry from the first cell phone he got at 19. The main purpose of his "Nokia brick" was to keep in touch with his future wife — now a child psychiatrist but at the time a young woman he met at a punk rock concert.